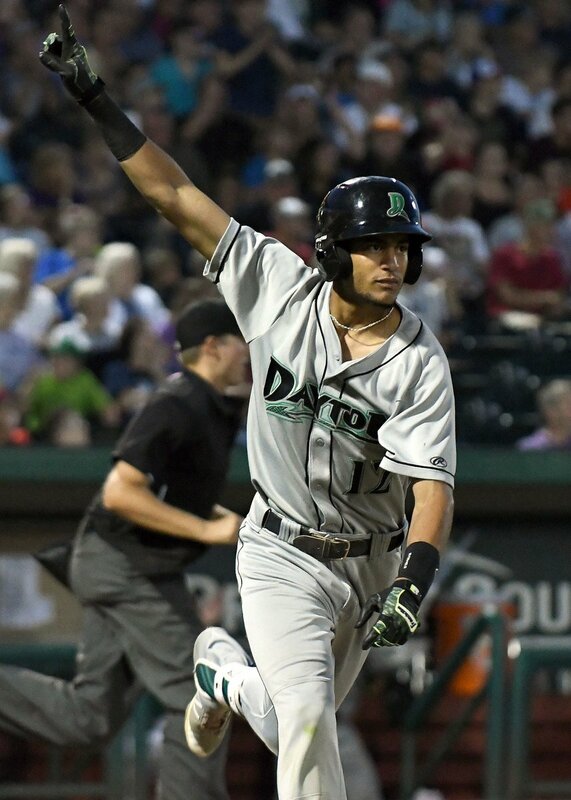 It didn’t happen until his last at-bat, but Dayton Dragons outfielder Jose Siri connected for a hit Monday to extend his hitting streak to 36 games, a new Midwest League record. Siri broke the record in his fourth at-bat, hitting an 0-2 pitch into left field for a single off TinCaps reliever Diomar Lopez. That came after Siri struck out three times against starter Michel Baez, whose stellar pitching performance shouldn’t be overshadowed by Siri’s accomplishment in Fort Wayne’s 4-3 win over Dayton. Baez gave up five hits and one run (on a homer by Nate Easley) while striking out 14 batters and walking none in 6.2 innings. He got the win, improving to 4-0 with a 0.91 ERA in five starts for the TinCaps. Also notable was Hector Vargas’ 4-for-4 performance for the Dragons. This entry was posted in Dayton Dragons, Fort Wayne TinCaps, Midwest League. Bookmark the permalink.